Arriva are running a brand-new bus tour on behalf of Medway Council exploring the countryside around Rochester that author Charles Dickens lived in and loved. The Dickens Country Experience tour is running twice a day at weekends until 21st December, except that there will only be one tour on 6th and 7th December when the Christmas Dickensian Festival takes place. Actors will bring the tour to life, travelling on the bus and portraying Charles Dickens and lesser-known local author Elijah Puddlephat, making for an amusing, informative and enjoyable ride. Tickets for the tour must be booked in advance and cost £10 (£7.50 for children and concessions). They can be bought online Medway Council's website or purchased from the Visitor Centre in Rochester High Street. The bus will then pick up outside the Guildhall Museum and visit a number of places of interest around Cobham, Higham and Cooling that were well-known by Charles Dickens and featured in his novels. 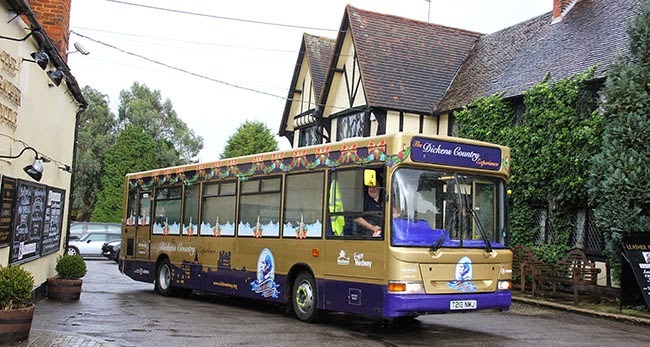 The eye-catching tour bus is decorated in gold and purple with seasonal graphics and will be driven by our regular Explore Medway open-top bus driver, Colin.